All planning starts with a goal that shall be fulfilled, and we need the plan for this journey. The planning circle will help us with plotting the journey. 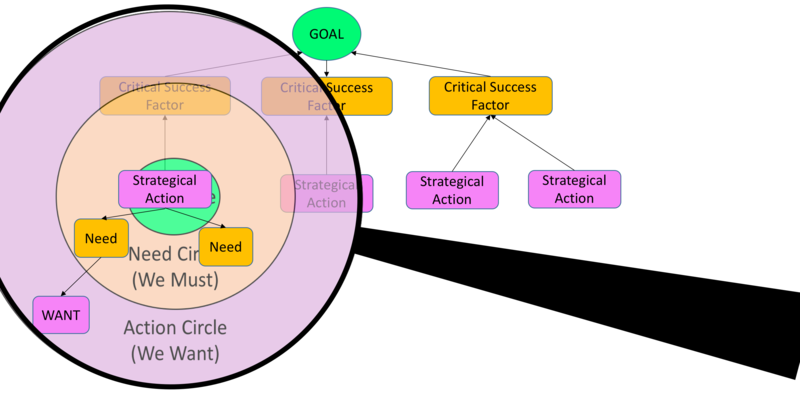 The Planning circle; the perspective of planning it is a bout defining the objective. 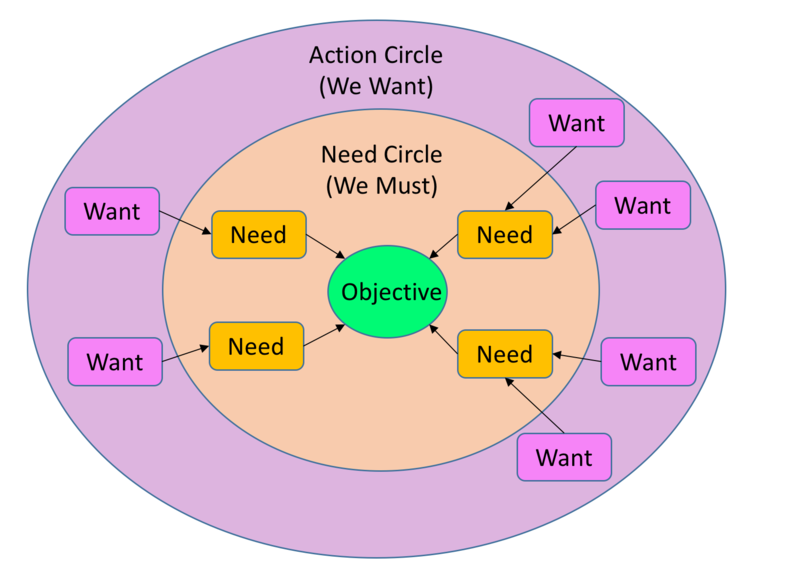 Surrounding the Objective, we have a circle of Needs, the things that must happen to meet the objective. 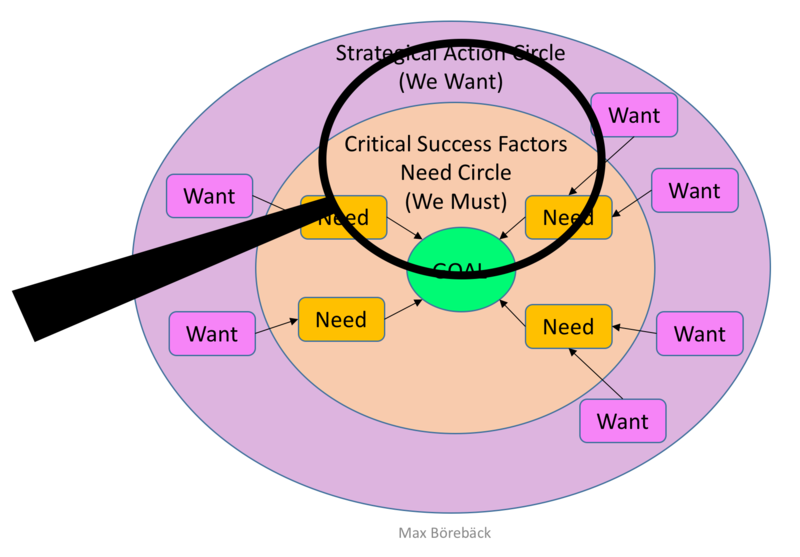 The outer circle is named Actions, here we have things we want and believe must be done to fulfil a need. There are often many actions required to fulfil a need. Define the end of the journey; the goal! 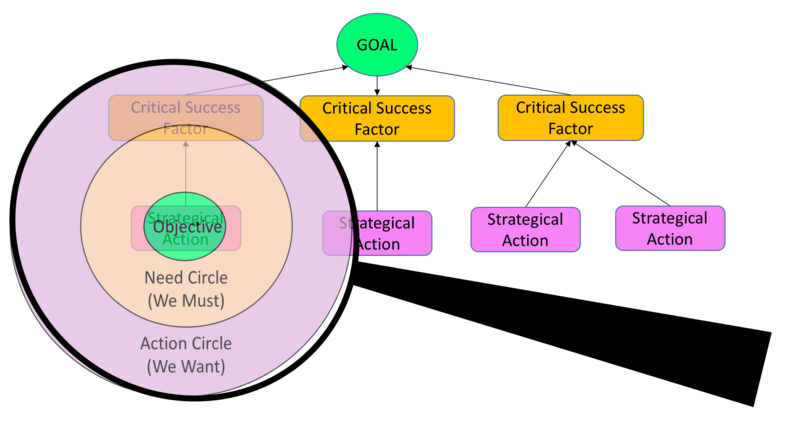 Identify the Critical Success Factors that makes the goal a reality! Create your current strategical decisions that you believe will fullfil the needs and take you to the goal! We now have the core foundation of the plan and are ready to plot the journey by identifying all steps we need to take to get there. Bring out the magnifying “planning circle” glass! 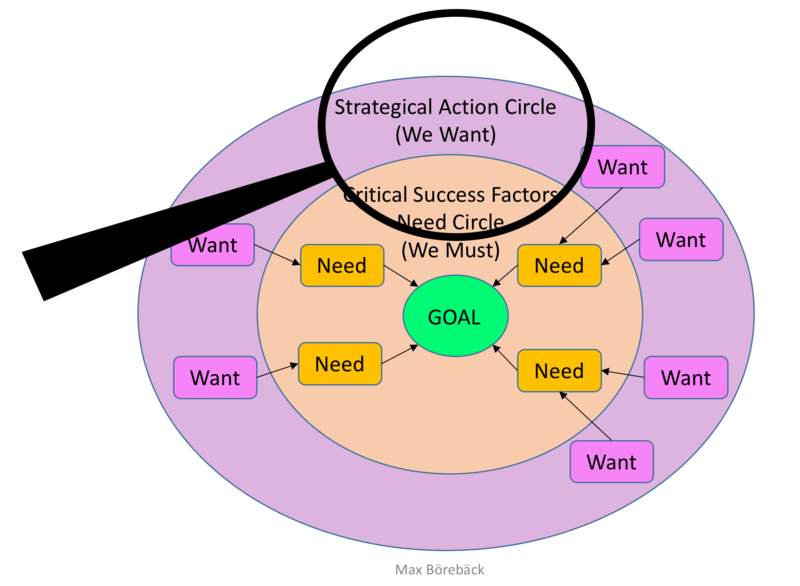 Place if over a strategical action that you shall break down., always focus on a want (strategical action) and identify the needs and the strategical action (wants) for those needs. Analyze it by making the Strategic Action your current objective! 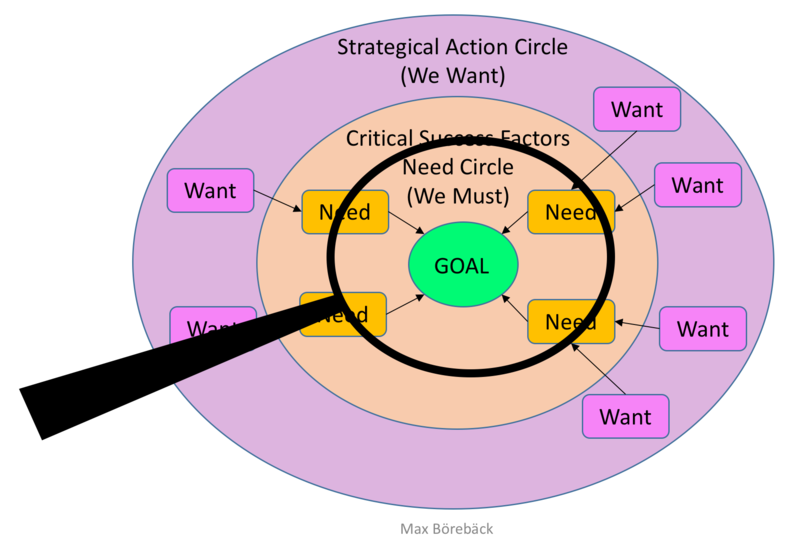 What needs exists that make the objective possible? For each need, what actions do I want to take to fulfil the need? 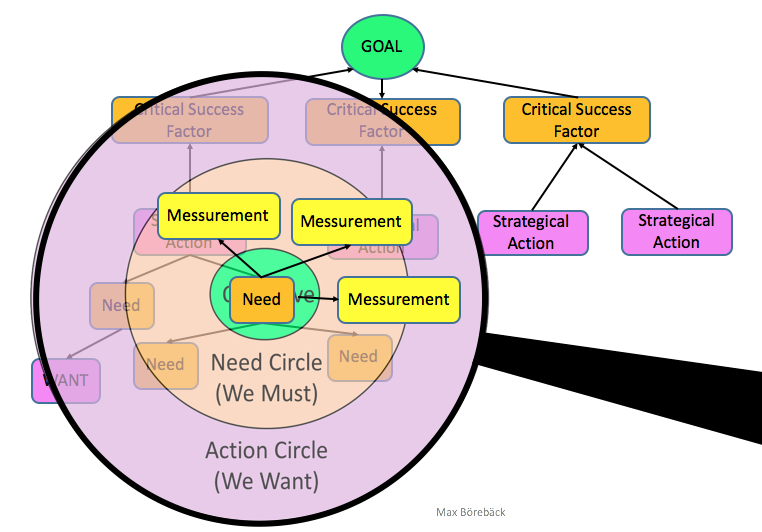 You can magnify on another strategical action (want) and identify the needs and the strategical actions for that need. You will soon have a readable tree, that is easy to justify and explain, and you also have a visible image of the journey and what steps that are needed to bring you there and why you have to take these actions. Keep in mind that a journey is never a clear path so it must be updated on regular basis to adopt to current reality and new demands. This magnifying technique can be applied to many of the Logical Thinking Processes trees, you might need to ask different questions, but it helps you with the focus and with asking the right questions. A measurement helps you validate that a step in your plan is fulfilled. If we look at a measurement they are hidden needs not described in the step or not expressed clear enough in the step. If our step is “I have a bicycle”, it does not reveal any requirements and could therefore be meet by any bicycle, we need some measurements to complement this step. Measurements are hidden needs that are not described in the text. 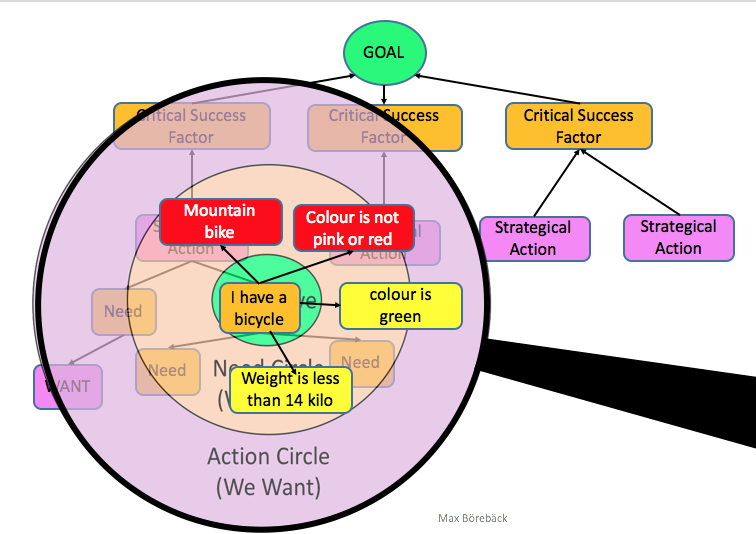 We use the planning circle and focus on the step, what needs do I have that will measure my step? As long as all red needs (measurements) are meet we are ok, but if all yellow is satisfied we are good and have a green step. Using traffic light, you can colour your tree to express how well you have meet the measurements of a step. Measurements can be expressed in various ways, like “> X < Y” or as a describing text. Measurements are needs that are not expressed in the step, but are key criteria for meeting the step. In above picture, I have coloured the whole plan based on status of the steps, it clearly indicated the status of the whole plan and you can see where your stoppers are. In one of the steps I have also added the measurements (step specific needs) in the text to make it clear to understand the details that has to be meet.